How to access your videos on YouTube, which includes the videos you've uploaded, playlists, and the videos you've liked. Step 1:Go to YouTube and log in. 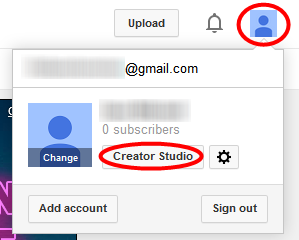 Click on your picture in the upper right corner and select Creator Studio. Step 2:Select View all under the VIDEOS section. 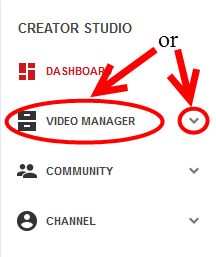 Alternatively you can click VIDEO MANAGER or the drop down arrow next to it in the panel on the left. Step 3:You will be taken to the Videos page, showing all the videos you have uploaded. Step 4:In the menu on the left, you can choose to view your videos, live events, playlists, search history, and your liked videos. 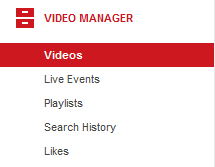 From the Videos page, you can also edit your uploaded videos and manage your playlists. For more information on accessing videos, visit this Hoonuit video.